It’s been nearly eight months since the inauguration of Donald Trump, and things could be a lot worse, notes longtime organizer Jeff Ordower. Yet it is not enough to simply congratulate ourselves for saving the Affordable Care Act or the Consumer Financial Protection Bureau, he says. Instead, we should be thinking about how to move the protests and uprisings of recent years onto the next level. I think the story is really critical. Uprisings and movements happen because something horrible happened or something that affects people is going to happen. They are going to poison the water on indigenous land at Standing Rock or there is yet another police massacre in cold blood or there are people who are worried about their healthcare and what is going to happen to them and more importantly what is going to happen to their children. That is really important and can’t be underestimated as a starting place. How we tell that story and who is affected and having affected people take the biggest and boldest risk, being in the front is critical. Then, I think a lot of times as organizers we sometimes fall into the trap where we want to have the perfect thing; either it is the perfect narrative, the perfect story—I know in the early days of the healthcare fight, for example, people were like, “If you want to move McCain, you have to get seven veterans to go to McCain’s office.” I think sometimes we try to be too strategic. Really, if people want to move, we have got to give them something to do that makes sense. Sometimes that is occupying a park or putting your bodies on the line and sometimes that is just like, “Show up with a handwritten letter. Here is your toolkit for organizing this alternative town hall.” I think creating those containers where everyone can take action is really, really important. It is no different than when I was first training as an ACORN organizer back in the 1990s and you sit on someone’s couch and you’re talking about neighborhood issues. The way people were going to get involved or not, you are saying, “What do you think it would take to get a stop sign on the corner?” and they would say, “I don’t know. We have got to get some people in the street” and you are like, “How many people would it take to block the street?” “Thirty.” You would say, “Great. Could you be one of those thirty?” and if they could see themselves doing that, then they were going to join. And if they thought it didn’t make sense, they wouldn’t. I think creating things that people can see themselves doing is really, really critical to all the fights. That ask is different. It is not always an easy thing to do. People will go and be in the streets as we saw in St. Louis, as we saw in Ferguson, night after night after night, because they felt like that was the most important thing that they could do. Mari Cordes is a nurse, union leader, and organizer who was outside of the Capitol when Trumpcare failed. But that’s not the end of her work on healthcare–she’s been organizing for years as part of Vermont’s movement for healthcare as a human right, which led to the passage of a groundbreaking bill for a universal publicly-funded system that was eventually shelved by the state’s governor. With Trumpcare now also on the shelf, Cordes is running for office and working on the ground to continue to make universal healthcare a reality. As my friend Sampson and I were heading toward the rally that night at the Capitol, we passed near an outdoor movie theatre and it turns out they were playing Star Wars. It was the perfect setting to hear that bombastic, symphonic music that is in Star Wars, because all of this still feels so unreal, so surreal, that this actually is happening in the United States. We heard so many incredible and painful and heartbreaking stories about friends, people that we know, people that we don’t know that would have died and/or families that would have lost their homes and/or gone bankrupt, all in the name of an obsession with an ideology, an obsession with a hatred that a black man was President of the United States and was successful in creating policy that was definitely not perfect, but did help millions of people. It was very powerful to be in that circle, that communion of sorts, and hold a vigil for our country whatever the outcome is going to be. In that moment, there was the moment of “We are going to lose” and that feeling of hopelessness and despair. Then, a pause and a quiet moment and Ben Wikler delivered it beautifully. He became really somber. I thought it meant that we had lost, but it created this silent space for us to hear the statement that the vote was “No.” I don’t think I have ever experienced anything so powerful in my life. It was incredible. The Senate passed the motion to proceed but so far hasn’t passed a healthcare bill, and activists aim to keep it that way. In Washington, D.C. there have been sit-ins, civil disobedience, and camp-outs; around the country activists are rallying to their Senators’ offices–including that of John McCain, who came to D.C. this week straight from cancer treatment to vote in favor of taking healthcare from his constituents. 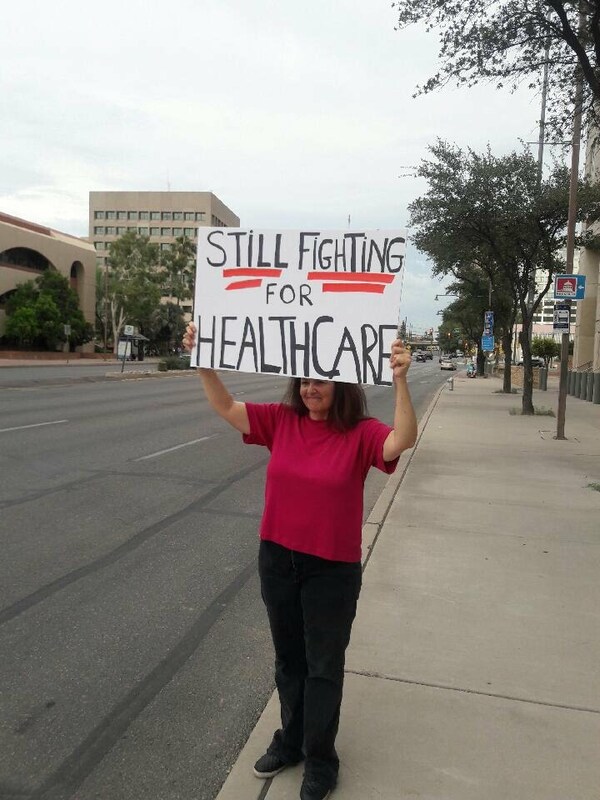 I spoke with two of those activists, who have been in D.C. and in Arizona fighting to keep their health insurance. Anastasia Bacigalupo: If you live in a state where your Senator is voting against the Affordable Care Act, now is the time to acquaint yourself with that Senator. I would recommend showing up to every single even that Senator has in the community: they have an open house, they cut a ribbon, they smash a bottle over a boat. Whatever they are doing, show up. Show up with signs. Requesting to meet with the Senator. Not everybody is comfortable with getting arrested and that is okay. You don’t have to get arrested to be a voice, to share your story. You can be out in the community and educate people. I think there are other groups you can also join besides ADAPT. I know MoveOn is very active. Various other Democratic groups are also very active. There are ways in which everyone can get involved in this. Senators really do listen to their constituents. It really makes a difference. Our blessing, being Californians, is that Senator Harris and Senator Feinstein are champions of disability rights and the disability community. We have a lucky circumstance, but even for us, we have friends, we have relatives in those states. You should be reaching out to those friends and relatives. Heck, it is summertime, take a trip and visit them. Talk to them about how to be active civically. The worst thing is thinking that these elected officials are in ivory towers. They got elected by your votes. They got elected by your friends’ votes, by your family members’ votes. Those votes are important. They have importance. I would say that if you live in a state where your Senator has voted the wrong way, you need to start engaging. If you can’t make it because of your circumstance, if you can’t get to those events, you can send a letter every day. You can send a postcard every day. You can send emails. If you have an iPhone, you can record yourself speaking and send it as an attachment. There is just so much that can be done. “Nuns on the Bus” helped pass the Affordable Care Act in 2010, with a letter that countered the Catholic Bishops’ opposition to the bill. 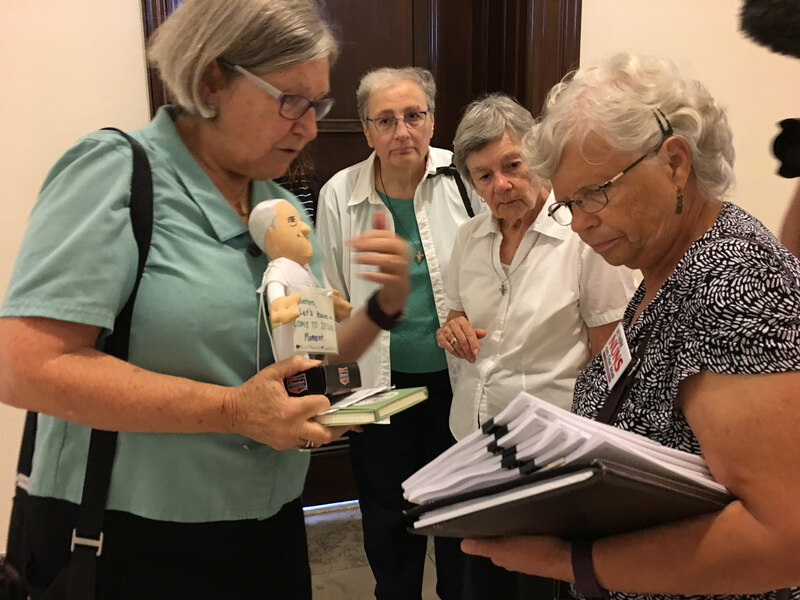 This year, as the Republicans make attempt after attempt to dismantle the bill they fought for, Catholic sisters are once again demanding that Congress listen to them and stop trying to make healthcare worse. Sister Simone Campbell was on Capitol Hill Monday and she spoke with me about the latest campaign. This time we’re taking a letter…signed by the sisters themselves, and all calling on the Senate to care for the most vulnerable. It’s outrageous for us as Catholic sisters who work with the most vulnerable in our nation to see that 23, 22 million people could lose healthcare because of this foolishness? That’s wrong. And so that’s the message that we’re carrying today: Stop it. 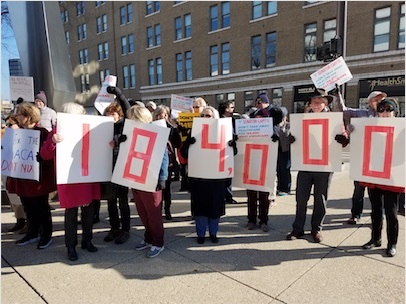 Faith leaders from around the country have joined in civil disobedience to protest the attacks on healthcare in Congress, as the Senate continues to see-saw back and forth on whether it will or will not attempt to repeal the Affordable Care Act. Rev. Dr. Liz Theoharis of the Kairos Center was one of those leaders, and is also part of the new Poor People’s Campaign, which aims to link political attacks on the right to vote with the material conditions of poor and working people across racial and geographic lines across the U.S.
LT: I think that part of why we see it as really important for faith leaders to step up in this is because healthcare and all of these issues are moral issues, for too long morality has been confined to a very small number of issues, many of which are barely discussed in faith traditions and texts, and they’ve been in the hands of folks that are trying to exclude and oppress. And instead, we’re saying that if you look at various religious texts within the tradition of Christianity that I come from, Jesus traveled around the countryside healing people for free. Clearly Jesus had a universal healthcare system, but in this time, in this moment, these kinds of healthcare cuts, this kind of repeal of the ACA is all being done in the name of and with the support of many Christians and politicians who claim to be Christian. And so it’s really important for faith leaders to say no, this is a moral issue, it’s a moral issue whenever you kill people because you deny them Medicare and Medicaid, whenever you deny people healthcare because they have preexisting conditions, that this is not OK in any of our sacred texts and it is a responsibility of everybody, including our moral leaders, our clergy, to not just talk a good talk but actually to be out there with people who are impacted fighting for the kind of healthcare system that we we want. The healthcare battle in the Senate has honed in on a few wavering “moderate” Republicans, many of them from states that are heavy users of Medicaid–and the ACA’s Medicaid expansion–for health insurance coverage. Shelley Moore Capito of West Virginia is one of those, and despite the state’s reputation as being the center of Trumplandia, Gary Zuckett of West Virginia Citizen Action Group says that people are ready to fight to keep their healthcare–and maybe even to make it better. Like you said, we are sort of labelled as Trump Country now and we have voted for the Republican candidate ever since George Bush II got elected. It is easy to paint in broad strokes like that, but I would also remind folks that in the Democratic primary last year, the State of West Virginia went for Bernie Sanders. So there is a hunger for a populist message here in West Virginia. Unfortunately, our current president and his false populism appeal to a lot of people. We have been painted as a backward regressive state and I think that is unfair. 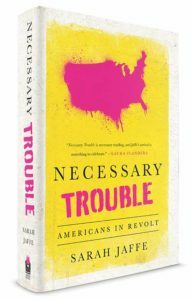 One of the things that we saw after the election was a total insurgency of people coming out of the woodwork wanting to be active. Newly minted activists and people that had been active in their youth and maybe are now retired and decided, “Well, I better get back into this because times are rough” and pulled together. There are Indivisible groups in most of the counties in West Virginia now. There are women’s huddles from the Women’s March that are still meeting here in West Virginia on a regular basis and talking to each other. We, out of this office, helped organize a sister Women’s March to the one in D.C. We had somewhere between 3,000-4,000 people show up at our state capitol, which blew everybody away, including us. Networks of activists around the country have been training in protest tactics for months; this week they put them to use in Washington, D.C. 80 were arrested bringing their message to members of the Senate, soon to vote on a proposal to repeal the Affordable Care Act and slash Medicaid funds. Jaron Benjamin of Housing Works was one of those arrested and has been one of those providing training to groups around the country on how to reach their members of Congress when said members don’t want to be reached. The day was pretty moving. And I think it was probably as impactful for people that participated as it was for people that saw it on the news. I didn’t expect that. When you get 150 and 200 activists, however many people we had in the room before we went to the Capitol, and a lot of these folks have either participated in protests or, since we had people from 21 different states, you would assume that people were already feeling as many feelings as they could feel, because everybody in that room is dedicated and committed, but one of the themes that I noticed when I talked to people after being released from cuffs was that we all got way more emotional, not only throughout the day but during the demonstration than we thought that we would. It turned out that we were more angry about this attempt to take away healthcare from millions of people than we possibly knew, and we cared more and we were moved to tears more during the protest. The day started off with about 150 folks getting together and just talking about why we were together and then going over the scenarios, figuring out which constituencies would be able to go and have a demonstration at which offices at one time. To the untrained eye it was chaotic but to a lot of us it was democracy in action. For us, what this bill will do is…disabled Americans will die. Others will be forced into institutions and increase this terrible feedback loop because institutions are more expensive. With capped funds it will drive more money to the institutions, making less money available for healthcare and services and supports in the community, so more folks will die and go into institutions. 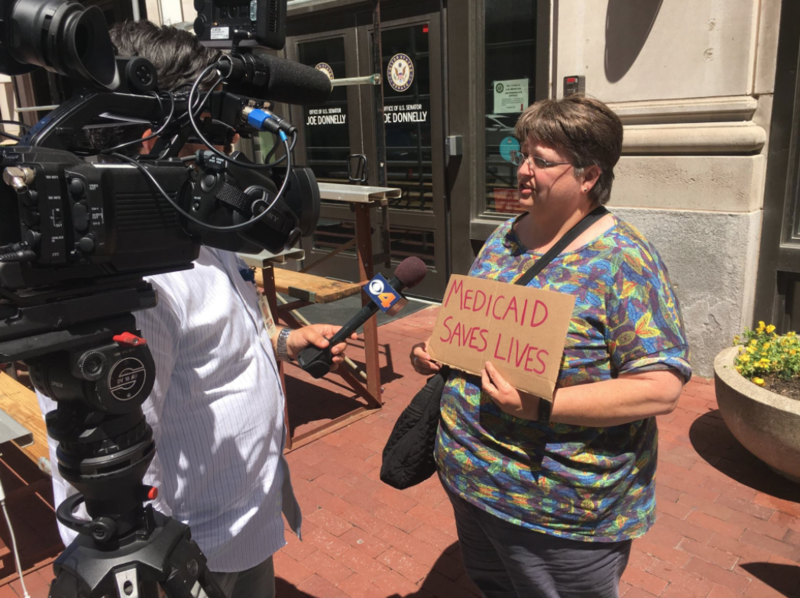 We wanted to people to see it is the equivalent of basically being dragged off; the way they saw it on the news, that is actually what happens, even now with the Medicaid program as it is. This will just make it far, far, far worse. …We wanted to highlight that using language that we thought, or hoped, Republicans would understand. There isn’t an asterisk on the Constitution that says “Except disabled Americans.” We should have a birthright of life and liberty. Medicaid is the thing that actually pays for and supports our lives and our liberty in the community. So cutting that is actually cutting the lives and liberty of disabled Americans. It is killing disabled Americans. We really wanted to drive that point home. After the election, Jesse Myerson wanted to build something in a place with little progressive infrastructure. He found himself in Bloomington, Indiana, where alongside Kate Hess Pace and a handful of other Hoosiers, he is helping to build Hoosier Action. Many of its earliest actions have focused on fighting Medicaid cuts on the state and national level. He’s also the host of a podcast that, like Interviews for Resistance, aims to spotlight organizers from around the country and the work they are doing.